A long days driving today. I said goodbye to my friends and set off from North Yorkshire in brilliant sunshine just after 11 am..
..and arrived at my brother's place in Kent just before 7pm. What's that? Around eight hours travelling. I kept steady at 55mph the whole way to get better fuel economy, which is also a relaxing pace to travel at in my van. I found the whole trip pretty easy going and enjoyable just cruising along on the motorway, but became pretty tired when I reached the M25 London orbital. Unfortunately not a good place to find somewhere to pull in for a break. 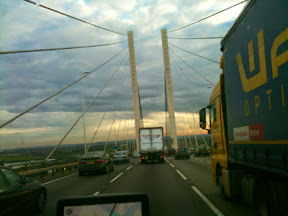 On the bridge at Dartford Crossing, over the Thames - it was around here that I experienced the busiest traffic in a very long time for me - So many peaceful months at Scoraig in the highlands with only a dirt track for a main road. I soon forgot about the tiring last stage of the trip though on my arrival here, with a warm welcome, a good meal and my nephews and niece all playing house in the back of the camper-van. Its also really mild this far south, the cold night air being left behind further north now. It's sure to be a fun day tomorrow with the kids! Do subscribe for updates, and thanks for your support!